Manager Scott Servais said the decision for Sunday's starter has not been made yet. HOUSTON — For the first time since his illustrious career began back on August 5, 2005 at Comerica Park in Detroit when he made his big league debut as a chubby flame-throwing phenom, Felix Hernandez — a stalwart in Seattle’s pitching staff for the better part of 14 seasons and face for the Mariners’ franchise — has been removed from the starting rotation because of ineffectiveness. 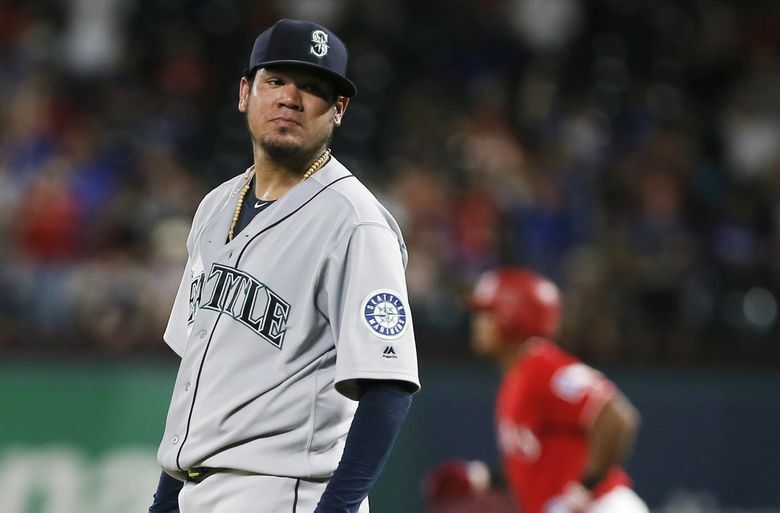 The man, who earned and embraced the nickname King Felix, turning into a whole personality and movement within the Mariners’ fanbase, has now been exiled to the Mariners’ bullpen. Prior to Thursday’s 8-6 win over the Astros in Houston, Mariners manager Scott Servais was asked in his pregame media session if he had made a decision on who would start the series finale on Sunday — Hernandez’s scheduled turn in the rotation. Those “things” consisted of meeting with Hernandez shortly after that media session to inform him that he was being taken out of the rotation. Servais’ decision became apparent when Hernandez, wearing his spikes and carrying his glove, walked out to the bullpen of Minute Maid Park with closer Edwin Diaz after the third inning. It wasn’t an enjoyable conversation for either party involved. Hernandez dressed and talked with teammates before seeing the assembled media standing nearby. “Are you waiting to talk to me?” he asked. “I got nothing to say,” he said. In what could’ve been his last start of the season, Hernandez posted a forgettable performance on Tuesday where the Rangers scored 11 runs (seven earned) off him in six innings pitched, including three homers. Hernandez’s spot in the rotation had been tenuous at best for the last three weeks. He’s posted an 8-10 record with a 5.73 ERA in 23 starts this season. He’s allowed seven earned runs in two of his last three starts and has just two starts of seven innings or more on the season. Servais is always controlled in his postgame responses, but his comments after Hernandez’s multiple poor outings this season have been all been similar to what he said after Tuesday’s game. One thing that does complicate the situation is finding a replacement for that Sunday start. Servais said it’s to be determined. Erasmo Ramirez is the obvious candidate. But he struggled in his third rehab outing on Sunday because of his some mechanical issues. The Mariners have decided to give him a fourth rehab start — scheduled for Saturday — to fix those issues. That means a starter would have to come from Class AAA Tacoma’s roster would have to be called up. The Rainiers currently have lefty Ross Detwiler listed as their Sunday starter, while Rob Whalen, who started on Tuesday is not on their probable pitching list. However, Whalen has struggled in his last five outings for Tacoma, posting a 5.73 ERA. The Mariners could also use right-hander Christian Bergman for another spot start. He’s done it twice before this season with mixed results. Bergman last pitched on Sunday. Once the ace of the staff, Hernandez status in the rotation seems to be dependent start to start. After pitching five innings and allowing two runs against the Blue Jays on August 2 at Safeco Field — an outing that seemed determinant on his spot in the rotation — the Mariners decided to keep him in the rotation for the start against the Rangers. But that outing vs. Texas was a disaster and reminiscent of too many starts this season — minimal command, no efficiency and plenty of hard contact. Hernandez has allowed three runs or more in 19 of his starts this season.